GALION — The Friends of the Galion Public Library will have its bi-annual book sale Thursday through Saturday in the Community Room at Galion Public Library. The sale has been a regular event at Galion Public Library for many years. Previously run by the League of Women Voters, the Friends of the Galion Public Library took over when league members could no longer keep up the event. Galion Public Library accepts donation of used books on a daily basis that contribute to the sale. Volunteers from the Friends of the library regularly come in to sort and keep the books organized well in advance of the sale. The sale is set up in three rooms in the lower level of the library. The Community Room contains all of the adult books and are a mix of fiction, non-fiction, and various other genres. The Staff Room is set up with all of the Children’s books, and the Board Room holds all of the media for sale including music and DVD’s. The Book Sale usually generates anywhere from $1,500 to $3,000 for the Friends of the Library. “A lot of people don’t realize how much work goes into the book sale,” continued Eckenrod. The Friends of the Library have also participated in the Pickle Run at Heise Park for the past couple of years by selling books and passing out information on upcoming events at the library. The public sale begins on Thursday May 3 from 9 a.m. to 8 p.m., Friday May 4 from 9 a.m. to 5 p.m. and Saturday May 5 from 9 a.m. until noon. 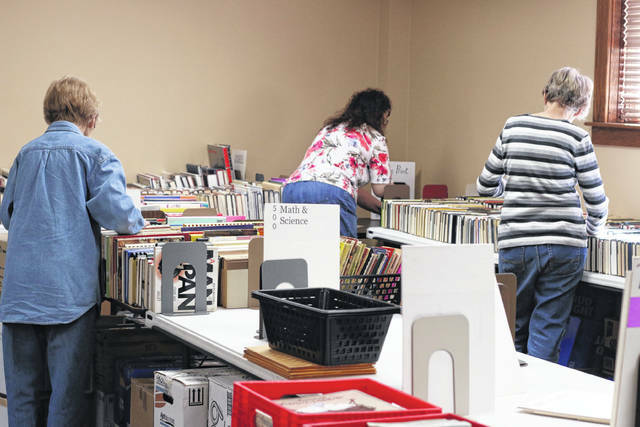 Erin Miller | Galion Inquirer Members from the Friends of the Galion Public Library sort books for their bi-annual book sale, which will be held on the lower level of the library beginning Thursday, May 3 through Saturday, May 5.
https://www.galioninquirer.com/wp-content/uploads/sites/38/2018/05/web1_IMG_1460.jpgErin Miller | Galion Inquirer Members from the Friends of the Galion Public Library sort books for their bi-annual book sale, which will be held on the lower level of the library beginning Thursday, May 3 through Saturday, May 5.